www.cedarmesa.com - Scott August's site with lots of NAF info and links. www.dreamwindflutes.com - Lee Entrekin's flutes are wonderful...each a masterpiece. www.firewindflutes.com/HOME.html - Scott Kennedy's amazing horn and bone flutes. www.billywhitefox.com - Billy Whitefox's river cane flutes in the tradition of his Creek tribe. 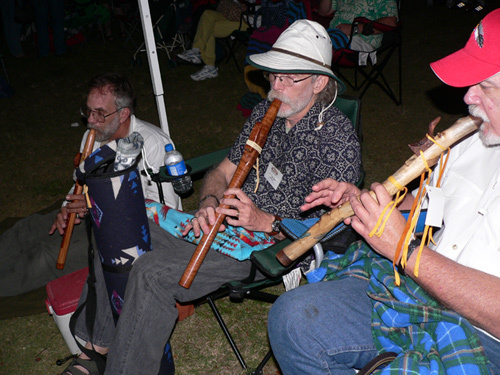 www.yazzieflutes.com - Marvin and Jonette Yazzie make flutes in the traditional manner. www.flutetree.com - lots of good NAF info. launch.groups.yahoo.com/group/CarolinasFluteCircle/ - The Carolina Flute Circle (CFC) site. www.flutekey.com - lots of good NAF info. www.fluteportal.com - The Ellis and Loomis Portal. groups.yahoo.com/group/nativeflutewoodworking - Advanced NAF making site. groups.yahoo.com/group/basic_naf_making - Beginning NAF making site. www.worldflutes.org - The INAFA site. www.musicalechoes.org - The BIG NAF festival. I also recommend flutes by Lee Entrekin (CFC), Doug Durant (CFC), Bob Child (CFC), Dan Arrington (FFC), Joey Hill (FFC) and Darrell Allen (GFC).